A back-of-the-envelope calculation suggests that it will cost Rs 12.5 crore per city per year for 10 years to report air pollution and its severity in real time. Sarath Guttikunda, is the director of Urban Emissions (India), an independent research group on air pollution, disseminating air quality forecasts for 640 districts in the country. The quality of air in India is bad and is becoming a serious public health issue with huge repercussions to our quality of life and economy. We know this through anecdotal evidence and through the little data on monitoring that trickles down to the public. This limited information is not enough – to formulate policy, to understand seasonal and diurnal variations, to tease out patterns or to calibrate forecasting models. It is the right of any citizen to have access to information on the quality of air she is breathing – monitoring data that is real-time, reliable and accessible to any citizen. 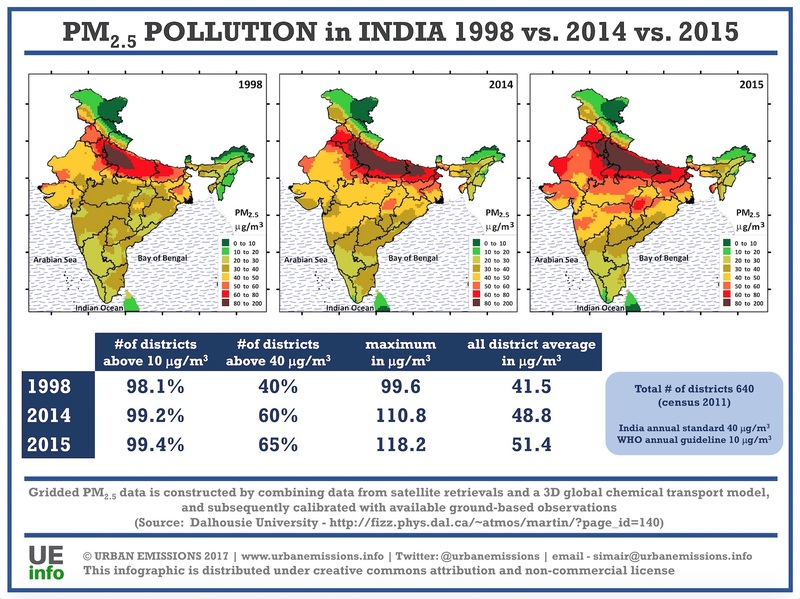 At present, the only study that estimates particulate pollution for all cities in India is the global burden of disease (GBD) study, which estimates ground level PM2.5 concentrations for the period 1998-2015. The results paint a bleak picture for India. The number of districts that exceed the annual average standard of 40 μg/m3 increased from 40% to 65% between 1998 and 2015. The annual average for all India PM2.5 concentrations increased by 25%. While the results of the GBD study do fill in this lacuna of information, it is not a substitute for real-time information. These results are obtained through a modelling exercise that combines satellite feeds, emission inventories and historical monitoring data to then estimate ground-based concentrations. Note that satellites neither measure one location nor take ground measurements at all times (orbital satellites create a snapshot of the entire planet every one or two days). These snapshots are interpreted using the global chemical transport models to better represent the vertical mix of these measurements (known as aerosol optical depth). Like any modelling exercise, this data also comes with uncertainty. While this process is very useful in establishing annual trends, these systems are not a substitute for daily on-ground monitoring. What we need are ground measurements using reference methods approved by the environment ministry. This ensures that the monitoring information is reliable and conforms to the government’s standards. Low-cost sensors do provide some information but because many of them are not recognised by the government or are not calibrated accurately, the data they generate cannot be used for policymaking. Even this limited information is not available in full, because of large gaps in data due to operational issues. From 2010 to 2017, more than 300 manual stations have been added to the program, bringing the total to over 600. However, we need to leapfrog from manually operated stations to continuous air monitoring systems for more reliable, more traceable, more accessible and more transparent information for real-time data analysis. In 2003, the CPCB developed a criterion based on regional population size to calculate how many air monitoring stations are recommended for that area. Fourteen years later, the number of stations in operation are far less than their own calculated numbers. As part of an air pollution knowledge assessment program, we studied 20 cities in India to understand the current level of monitoring operations and assess the sources of air pollution. The table below presents a summary of the number of air monitoring stations in the city, a summary of the data from the manual NAMP stations between 2011 and 2015, and a summary of our estimate of the recommended number of continuous monitoring stations in the city. For PM10, the annual average standard is 100 μg/m3. All cities, except for Coimbatore, exceed this value. Five out of 20 cities record more than three-times the annual standard. The sources contributing to PM10 concentrations are everything that burns: coal, kerosene, petrol, diesel, biomass, cow dung, waste and dust. For sulphur dioxide, the annual average standard is 50 μg/m3. 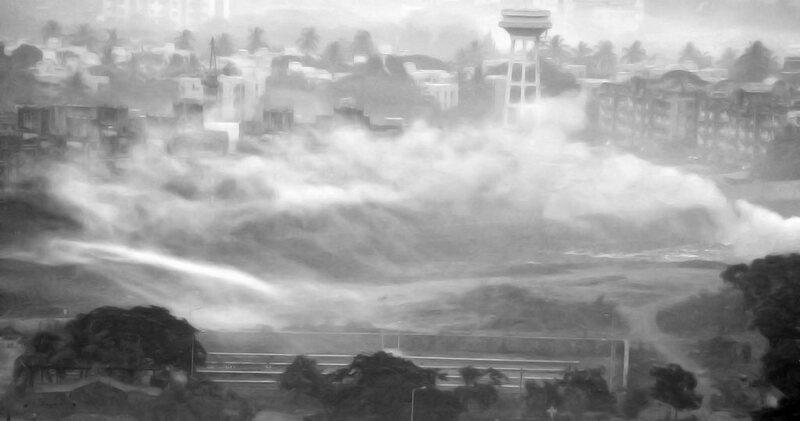 All of the cities have sulphur dioxide levels within the standards, with Chennai and Pune recording the highest concentrations. This pollutant is created from the combustion of coal and diesel. For nitrogen dioxide, the annual average standard is 40 μg/m3. Nine of 20 cities exceed this value, with Bengaluru, Chennai, Jaipur, Nagpur, Kanpur and Pune recording the highest concentrations. This pollutant is a by-product of petrol and diesel combustion (i.e., transport related emissions). Can we afford to upgrade the monitoring program? 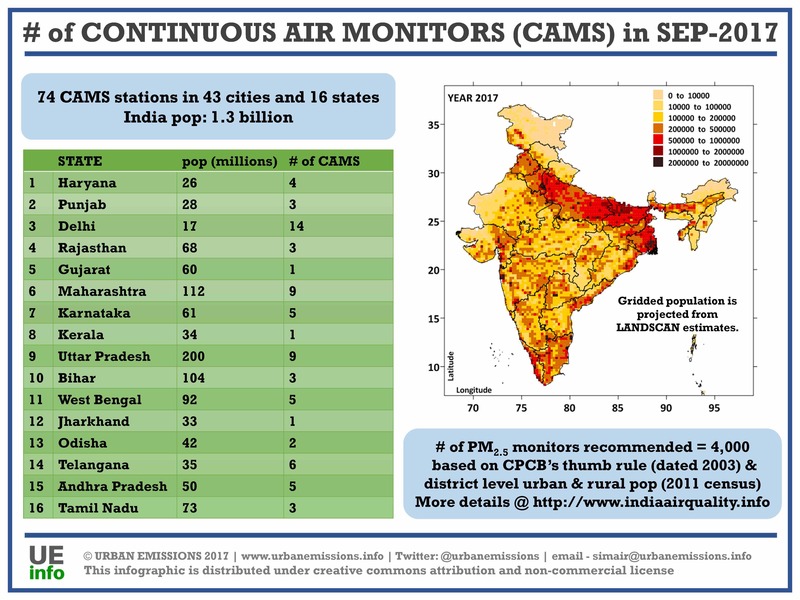 As of September, 2017, under the CPCB, there are 74 continuous air-monitoring stations operating in 16 states and 43 cities, with 19 of the latter operating in and around the Greater Delhi region (14 in Delhi and one each in Noida, Ghaziabad, Rohtak, Gurgaon and Faridabad). Most cities have one station to represent the full range of criteria pollutants. This is inadequate because it generates a statistically insignificant sample to represent the city or the range of sources contributing to the pollution problem in the city. Let us assume, for the sake of feasibility, that we want to upgrade air quality monitoring in 60 cities (those with at least one million population as reported in the 2011 Census and those selected under the SMART cities program). These cities account for about 30% of the national population. Here are some rough calculations for introducing and operating a continuous air monitoring program for 10 years. These calculations provide an estimate for the probable investment required for the program based on discussions with suppliers and subject to change over time. The average cost of a continuous air monitoring station (measuring all the criteria pollutants and meteorological parameters) is approximately Rs 1 crore, plus 10% by way of an annual maintenance fee (as reported for a station to be commissioned in Gurgaon in 2017). Based on our assessment for the 20 cities, we have an average requirement of 25 stations per city, which puts the required number of stations at 1,500 in 60 cities (it is given that a big city like Bengaluru can use >10 stations and a small city like Dehra Dun can use <10 stations). This translates to a required initial investment of Rs 3,000 crore (including 10% annual maintenance fees for 10 years). Cost of infrastructure, personnel and training could be an additional 100% (our guess is that this is on the high side, given that the CPCB already operates over 600 manual stations across these cities with the requisite infrastructure and personnel already in place). Even if we assume a 50% additional miscellaneous cap on the prices and fees over time, this puts the tab at Rs 7,500 crore for 10 years or, on average, a distributed cost of Rs 12.5 crore per city per year for 10 years. For 60 cities to be environmentally smart and report air pollution and its severity in real time, for 10 years, this is not a big sum. For comparison’s sake, the cost of the metro systems under construction and those operational is approximately Rs 100,000 crore in Delhi, Rs 40,000 crore in Bengaluru, Rs 16,000 crore in Hyderabad and Rs 64,000 crore in Chennai. The Smart City Initiative is a program spearheaded by the Centre, where cities use “smart solutions that provide core infrastructure, give a decent quality of life to its citizens and provide a clean and sustainable environment”. Today, 60 cities have already been selected to participate in this initiative. The total anticipated investment is Rs 144,742 crore, with funds from the Centre and state governments. And monitoring air pollution falls squarely within the idea of this initiative. It is real time information that will provide much-needed direction towards improving the environment in any city. Monitoring is an urgent need – even when sanctioned, it will take some time to set up systems and to get the timeline of data required to map a conducive air pollution action plan. We have the rationale, the technology and the budgets. What then are we waiting for?